Loansharkpro has been constantly receiving many requests through email about building an actual list of Native American Tribal loans direct lenders. We have compiled a huge 30+ list of the Direct tribal installment & payday loan lenders. The list is mostly focused on the number of the actual active native american lenders as of 2017 – 2018. It is a listing that covers all the current active indian reservation payday loans who are issuing tribal loans to their customers. There’s no special ranking order in this lenders list. Also, don’t think of it as list that you can use to define the quality of the tribal loan lenders’ services. As is it’s supposed to be, the new tribal lending companies will keep on appearing on the market in 2019 while several others go away. For example in 2016 a great deal of direct tribal lenders for bad credit companies ceased their presence on the market. 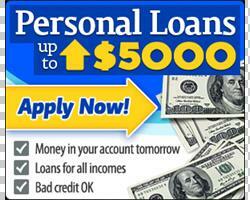 To see our list of Direct Payday loan lenders click here. What is a tribal loan? Tribal loans are a payday loans alternative designed to help you meet short-term borrowing needs, such as for car repair, medical care for you or your family, travel expenses in connection with your job, or anything that requires cash quickly. With a Mobiloans line of credit, get the emergency cash you need. 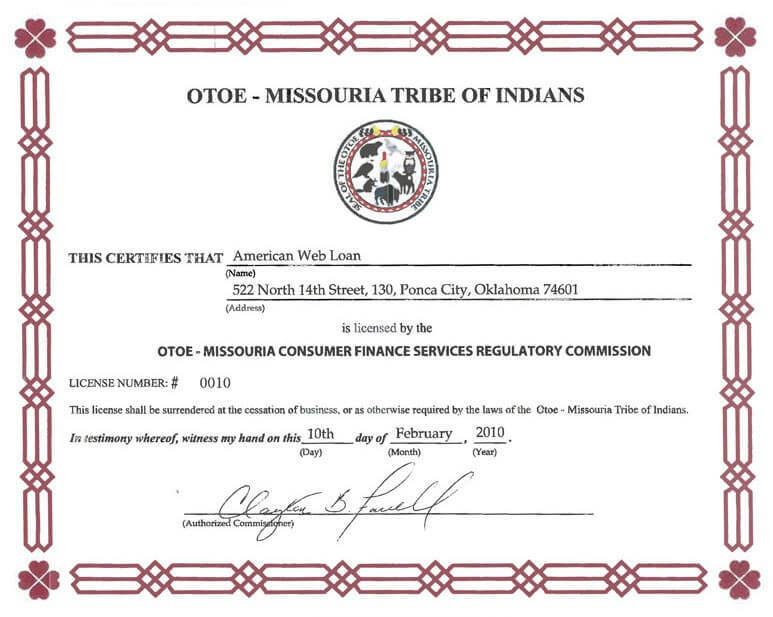 MobiLoans, LLC, a tribal lending entity wholly owned by the Tunica-Biloxi Tribe of Louisiana (“Tribe”), a federally recognized Indian tribe, operates within the Tribe’s reservation. With Mobiloans, you get a line of credit, but the money you draw goes to your checking account or you can elect to receive it by check. You can draw as little or as much as you need. As you repay your line, you can draw more cash. A Mobiloans line of credit is the new, more flexible way to borrow emergency cash. Use it to avoid costly bank overdraft fees and payday loans. With flexible payment options and no hidden fees or prepayment penalties, a Mobiloans line of credit gives you more ways to manage life’s everyday expenses. The Annual Percentage Rate (APR) ranges between 206.73% – 425.45%. Learn financial basics while earning rewards with Mobiloans. Qualifying for a tribal personal loan is easy. Have steady income of at least $700.00 per month from a verifiable source. Have an open bank account in good standing. Be at least 18 years old and a permanent U.S. resident. How Is Mobiloans different from the other direct tribal lenders? Choose Mobiloans and if approved you may get the funds you need in as little as 24 hours, with no hidden fees. Earn 15% – 80% off cash advance fees and fixed finance charges when you make on-time payments. Mobiloans performs soft credit inquiry and will not impact your credit score. If all the pertinent information is received by 5:00 p.m. CST and can be verified on Tribal land the same day, you will generally receive the funds via ACH as early as the next Business Day. Bad credit problems won’t always prevent applicant from being approved for an installment loan from Mobiloans. We encourage you to pay off the loan as quickly as possible to save on interest. Mobiloans is an expensive form of short term credit and should not be used as a long term solution. Tribal lender personal loans should be used for short-term financial needs only, not as a long-term financial solution. There is a Cash Advance Fee of $3.00 for each $20.00 of cash advanced up to $500.00; a Cash Advance Fee of $2.00 for each $20.00 of cash advanced over $500.00 up to $1,000.00; a Cash Advance Fee of $1.60 for each $20.00 of cash advanced over $1,000.00 up to $1,400.00; $1.40 for each $20.00 of cash advanced over $1,400.00 up to $2,000.00; and $1.00 for each $20.00 of cash advanced over $2,000.00. Additional fees may apply for checks returned due to insufficient funds. Fixed Finance Charges vary depending on the outstanding principal balance from $10.00 – $135.00 per billing cycle. 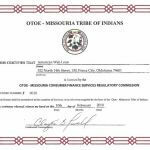 Mobiloans tribal lender installment loans are not available to residents of all states, and those states may change from time to time with or without notice. Mobiloans does not operate in Arizona, Arkansas, Colorado, Connecticut, District of Columbia, Georgia, Illinois, Louisiana, Maine, Maryland, Massachusetts, Minnesota, Montana, New Hampshire, New Jersey, New York, North Carolina, Pennsylvania, South Dakota, Vermont and West Virginia. WLCC Lending BGL does business as Bison Green Lending and is a Native American owned company operating within the boundaries of the Pine Ridge Indian Reservation in South Dakota. Pine Ridge is home to various business and economic endeavors that support our tribal members. Bison Green Lending provides installment loans to qualified borrowers following all federal and state regulations and guidelines for lending. But remember, installment loans are still an expensive form of borrowing and are only intended to help you for your emergency financial needs. The minimum initial loan amount is $200.00. The maximum loan amount is $750.00 subject to approval. Loan cost: Typical each loan payment is every 14 days, with a finance charge of $30 per $100 borrowed. Online installment loans offer you more options to borrow less, so you can pay off your balance quicker and get back on your feet. Bison Green’s cancellation policy allows you to return the full amount of your loan at no charge by 5:00 pm MST the next business day. How much can I borrow and how do I qualify? You have two valid contact numbers. How Is Bison Green different from the other direct tribal lenders? If approved, applications processed and approved before 12 pm MT Monday through Friday are typically funded on the next business day. Bison Green works with the customers to find out what loan amounts and payment options will work best for them. Bad credit or no credit history, Bison Green understands installment loans may be the only resource some people have for a loan. By paying off your full balance earlier, you can reduce the finance charges you pay. There are no early pay-off fees on Bison Green loans! Bison Green loan fee is consistently less than overdraft fees at banks, bounced check charges, taxes, and credit limit fees. How do Bison Green loans compare? We strongly encourage principal reduction and early payment to reduce your finance charges. Bison Green is an expensive form of short term credit and should not be used as a long term solution. In order to complete your loan and get your cash into your bank account, you MUST confirm your loan details with us after submitting the form and getting an approval. Your first installment will be due on your next pay date that falls at least 5 days away. If your next pay date is less than 5 days away, your due date will be the following pay date. If the due date of a specific payment in your installment loan cycle falls on a weekend or holiday, your due date will automatically be adjusted to either the business day before or after the conflicting date, according to the terms of your loan agreement. If a payment is returned because there are insufficient funds on deposit, or your payment is dishonored by your financial institution for any reason, then you will be assessed an NSF fee of $30. If any payment is late by five days or more after the due date, then you will be responsible for an additional $30 late fee for each late payment. If a payment is not made by your installment date, you will be subject to additional fees. Bison Green Lending is a Native American owned business, and as such, tribal law will apply to your loan contract, and not state law. If you encounter difficulties in repaying your loan on the scheduled installment date(s), you can contact Bison Green to arrange a payment plan that meets your needs. For customer service issues please call 877-670-8891 Mon through Fri between the hours of 7 am to 7 pm MST. You can call the Online Lenders Alliance consumer hotline to report fraud at (866)-299-7585. Bison Green Lending does not lend to residents of CT, MN, NY, SD, VA, VT, WV Guam, Puerto Rico. Availability of installment loans are subject to change at any time at the sole discretion of Bison Green Lending. Greenline Loans is a fast and simple solution for your short-term cash needs. Applying for a loan takes just a few minutes and you can know within a few minutes if your application is approved. In most cases, your loan can be electronically deposited into your bank account the next business day! We pride ourselves on our customer service and go to great lengths to inform you of how your loan works. We offer you loans with flexible payment options that allow you to pay back the loan at your pace. Term installment loans provide the cash needed to meet immediate short-term cash flow problems. The minimum loan amount is $300. The maximum loan amount for first time borrower is $300. The maximum loan amount for other borrowers is $1,000. (For example: a $300 loan will have a finance charge $594.33, therefore the total of payments equals to $894.33 repayed by 10 equal payments of $99.37 each charged every two weeks). How Is Greenline Loans different from the other direct tribal lenders? Automatic ACH Direct Debit – You can authorize payments to be taken out automatically from the bank account where the money was received. Make a payment via Debit card or a Certified Check. Pay early and there is no prepayment penalty. Finance charges do not continue to accrue on amounts that have been prepaid, but only on the unpaid balance of the loan. Greenline loans is an expensive form of short term credit and should not be used as a long term solution. Loans are written for the maximum number of payments available. No extensions, renewals, or “rollovers” are permitted. A borrower may pay off his/her loan early (prepay) and avoid or reduce finance charges that would otherwise be incurred if the loan is not paid off early. Please call us if you have concerns with making a payment in a timely manner (877) 596-1337. In many cases we will be able to reschedule your payments. Any late or non-payments may be subject to additional fees and/or collection activities. Late charge fees will not exceed 10% of any payment not received within 5 calendar days of its due date. Greenline loans verifies applicant information through national databases including, but not limited to, Clarity, Factor Trust and MicroBilt and we may pull your credit in order to determine your eligibility and ability to repay. If you have already contacted Customer Service in an attempt to resolve an issue or concern and still need additional assistance, please contact the Ft. Belknap Tribal Hotline at (888) 517- 3696. Monday – Thursday: 7:00 AM to 7:00 PM MST. Friday: 7:00 AM to 5:00 PM MST. Greenline Loans does not lend to residents of Arkansas, Colorado, Georgia, New Hampshire, New York, Maryland, Minnesota, Montana, Puerto Rico, Utah, Vermont, Virginia, Washington, and West Virginia. Availability of installment loans are subject to change at any time at the sole discretion of Greenline Loans. West River Cash is a Native American owned business operating within the boundaries of the Fort Belknap reservation. This means all lending practices are governed by tribal law. This provides consumers with a means to receive cash they might otherwise not receive, while providing a vital means of employment to members of our tribe. The table above shows a sample amortization table for West River Cash installment loans so you can see how rates and interest might be applied to your loan. Please note rates, interest and terms will be tailored to each individual customer and may differ substantially from the example below. Your loan terms will be fully disclosed in your loan contract. Qualifying for West River Finance tribal personal loan is easy. You must have consistent, verifiable income and an active bank account that has been open for at least ninety (90) days. You must also receive income of at least $1,500 per month. Military personnel and individuals with dependents in the military are not eligible. How Is West River Finance better than the other direct tribal lenders? Your application is reviewed in just a few minutes. You will receive the deposit directly to your bank account the next business day following your loan approval (for applications processed by 4:30 p.m. ET). You can make a payment before or on the due date as specified in your loan agreement via ACH, debit, cashiers check or money order. Generally, your due date will fall on your next pay date. If a payment is 3 days or more late or if your payment is returned by your bank for any reason, you will be charged $30 dollars. If you need to change your payment schedule for any reason, you must notify West River Cash at least two (2) business days prior to the next payment date you are scheduled to make. Due Date Options: Your first payment is due on your following pay date. If that day happens to fall on a weekend or holiday, the payment will be due on either the business day immediately prior to or the business date immediately following; this will be specified in your loan agreement. West River Cash does not lend to residents of West Virginia, New York, Montana, Maryland, or Arkansas. Availability of installment loans are subject to change at any time at the sole discretion of West River Cash. Qualifying for Green Trust Cash tribal personal loan is easy. How Is Green Trust Cash better than the other direct tribal lenders? Bad credit or no credit alone does not determine loan approval. Instant Bank Verification (IBV) is a safe and secure process that allows us to temporarily view your bank statements. It will not allow the lender to access, withdraw, credit or transfer funds from your account. Your funds will be electronically deposited via ACH to your bank account on the next business day. Green Trust Cash does not perform credit checks with the three major credit reporting bureaus (Clarity, Factor Trust, and MicroBilt), however, credit checks, or consumer reports may be obtained by alternative providers, as well as verification of identity data points and active military status verification. If a payment is 5 days late a charge equal to 10% of the payment due will be applied, furthermore, a non-sufficient funds/returned item fee of $30 may be applied. Green Trust Cash does not lend to residents of Arkansas, Connecticut, Massachusetts, Montana, New York, Pennsylvania, Puerto Rico, Vermont, Virginia, West Virginia, American Samoa, Armed Forces Americas, Armed Forces Europe/Canada/Middle East/Africa, Armed Forces Pacific, Canal Zone, Commonwealth of the Northern Mariana Islands, Guam, Marshall Islands, Minor Outlying Islands/States of Micronesia, Northern Mariana Islands, Outside US, Palau, Phillippine Islands, Trust Territory of the Pacific Islands, Virgin Islands. Availability of installment loans are subject to change at any time at the sole discretion of Green Trust Cash. Niizh, LLC does business as Bright Star Cash. Niizh, LLC is a Native American owned business created by and for the Lac Du Flambeau Indian Community, a Sovereign American Indian tribe. Our business is operated on the Lac du Flambeau Reservation located in Wisconsin. 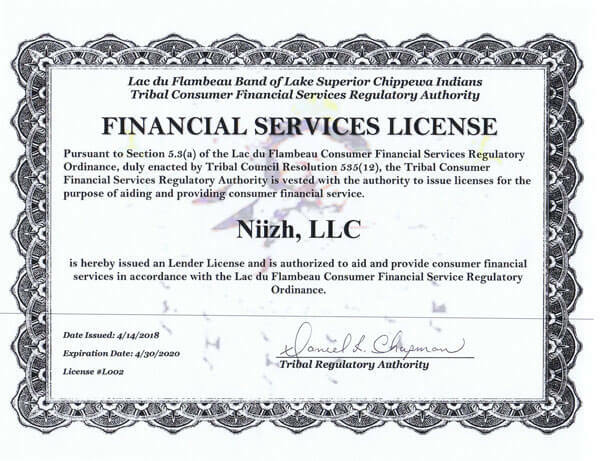 Niizh, LLC is an instrumentality and limited liability company which abides by all applicable federal laws and regulations established by the Lac du Flambeau Indian Tribe. 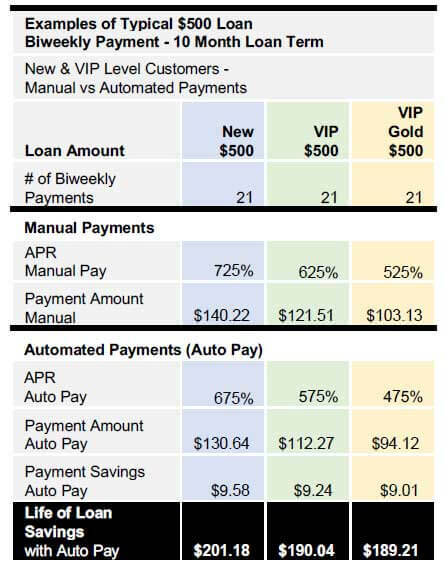 Below are two $300.00 loan sample payment schedules listed for a new customer and a returning customer at the Elite Level. Please note that the APR may vary and is based upon the total loan duration, amount funded and payment frequency. 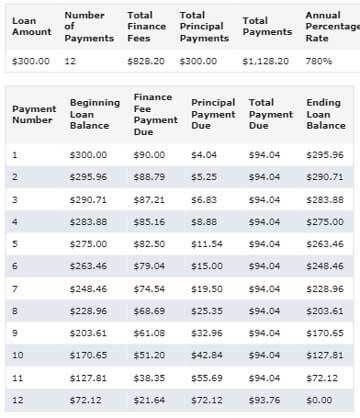 The amount you will have paid after you have made all of the payments as scheduled. Qualifying for Bright Star Cash tribal personal loan is easy. How Is Bright Star Cash better than the other direct tribal lenders? Returning customers are eligible for a reduced APR which is based on credit history with Bright Star Cash, verification of the information provided by the consumer, payment history with Bright Star Cash and other credit criteria. Online Banking Verification System (OBVS) – a small and simple utility that will allow you to easily send a copy of your online bank statement to us so that Bright Star Cash may quickly verify your employment and approve your loan. It will not allow the lender to access, withdraw, credit or transfer funds from your account. You can choose to pay your loan back via electronic funds transfer from your bank account (ACH, Debit Card) or by mailing a money order or certified/cashier’s check to us at PO Box 502, Lac Du Flambeau WI, 54538. You may request a 5 days courtesy extension of your due date with no additional fee. This option is available once per loan. You can also contact customer service at (800) 986-2165 for other options available to you. There are no pre-payment penalties and paying off your loan off faster will save on finance charges. Due to sovereign immunity, neither LDF Business Development nor Niizh, LLC may be sued in court or in an arbitration, either individually or as part of a broader action. Bright Star Cash verifies applicant information through national databases including, but not limited to, Clarity and Factor Trust and we may pull your credit in order to determine your eligibility and ability to repay. Wire funding is available to returning customers only. If you elect to do wire funding, an additional fee will be charged. Wire funding is available until 2:30pm CST. If your loan is finalized on Saturday, Sunday or bank holidays and you do not select wire funding, your loan will be funded on the second business day. Next day funding cut off time is 3:00 CST Mon-Fri. If a successful payment is not made by your due date, an additional late and/or NSF fee of $30 will be assessed. Bright Star Cash does not lend to residents of Arkansas, Florida, Maryland, New York, Virginia, West Virginia, and Wisconsin. Bright Star Cash does not lend to new customers in the following states: Alabama, California, Massachusetts, Mississippi, North Carolina, Ohio, Wyoming, Missouri, Nevada, Washington, Pennsylvania, Alaska, Hawaii, Maine, Minnesota, Vermont, Texas and Arizona. Availability of installment loans is subject to change at any time at the sole discretion of Bright Star Cash. Clearwater Lending, LLC d/b/a/ CashFairy.com is a Tribal enterprise and economic arm, wholly owned and operated by the Ft. Belknap Indian Community (“Tribe”), a federally-recognized sovereign American Indian Tribe, and created by the Tribal Council for the benefit of the Tribe. Any Agreement entered into through this Application shall be governed by applicable Tribal and federal law. Qualifying for Cash Fairy tribal personal loan is easy. How Is Cash Fairy better than the other direct tribal lenders? Cash Fairy does not offer online installment loans in Arkansas, Montana, New York, North Carolina, Virginia, West Virginia or US territories). Cash Fairy reserves the right to add or subtract from this list at any time. Golden Valley Lending is owned by the Habematelol Pomo, a federally recognized tribal group of Upper Lake, California. We not only lend consumers money when they need it most, we offer the tribe a way of achieving economic self-sufficiency. Ancestral Pomo people have occupied parts of central and Northern California for as long as history has been recorded. And today, those who have remained or returned to the ancestral tribal lands seek to conserve the land, educate their children, preserve the Pomo culture and provide economic stability to the community and people. The Habematelol Pomo offers a payday loan alternative through Golden Valley Lending to provide you with the financial resources you need when you need it most. Receive an approval decision in just 4 easy steps! How Is Golden Valley Lending different from the other direct tribal lenders? Golden Valley Lending offers borrowers fixed-term installment loans instead of traditional payday loans. With an installment loan, you agree that you will repay the loan amount together with interest in regular payments over a set duration. After approval, you will make 20 simple bi-weekly payments, which decrease in size over time. An automated payment option is available to make repaying your loan more convenient. Each of your payments will include principal along with interest. By paying off a percentage of your principal with each payment, you reduce your principal balance along with the corresponding interest. This means that your payments will be successively smaller with every one that you make. Proprietary scoring system uses the information you provide in making an approval decision. Though you are not guaranteed to be approved for a loan, these short term loans are designed to help individuals with Bad Credit or No Credit. Money can be deposited electronically into your bank account through a secure ACH transfer by the next business day upon approval by 4:30 PM EST Monday through Friday. You may pay your loan in full at any time without penalty, and your finance charges will be prorated if it is prior to your due date. You may pay additional amounts toward your principal on scheduled payment due dates. Golden Valley Lending utilizes a secure 128-bit SSL certificate for all input items. They also employ several different security services to prevent hacking or data intrusion. Golden Valley Lending does accept debit card payments! You may also call Customer Service at 855-214-8144 or reach an agent via Live Chat from our website. If you have previously given consent to receive text messages and have changed your mind, you can opt out of receiving further text messages by reply texting the word “STOP” to a previous text or by calling us at 855-214-8144. If you want to go back the ACH billing, contact one of our Customer Service Agents at 855-214-8144. In some cases, we may not be able to verify your application information and may ask you to provide certain documents, which may delay funding. If sufficient funds are not available on the payment due date, contact Customer Service at 855-214-8144 and an agent will be available to assist you with exploring other payment options. Otherwise your payment returns for insufficient funds, a $20 insufficient funds fee may apply and you may incur overdraft fees from your financial institution and your payment may be resubmitted. If that resubmitted payment returns for insufficient funds, your account may be suspended until all monies are paid, and our collection process will begin. You are only eligible to receive one loan with us at a time. We base our decision on the information you have provided in your application and may run a credit check using a specialized credit bureau. Golden Valley Lending does not accept credit card payments at this time. Golden Valley Lending tribal lender installment loans may not be available to residents of some states, and those states may change from time to time with or without notice. You may contact us at 95485-8793 to verify. American Web Loan is a tribal lending entity wholly owned by the Otoe-Missouria Tribe of Indians, a sovereign nation located within the United States of America. 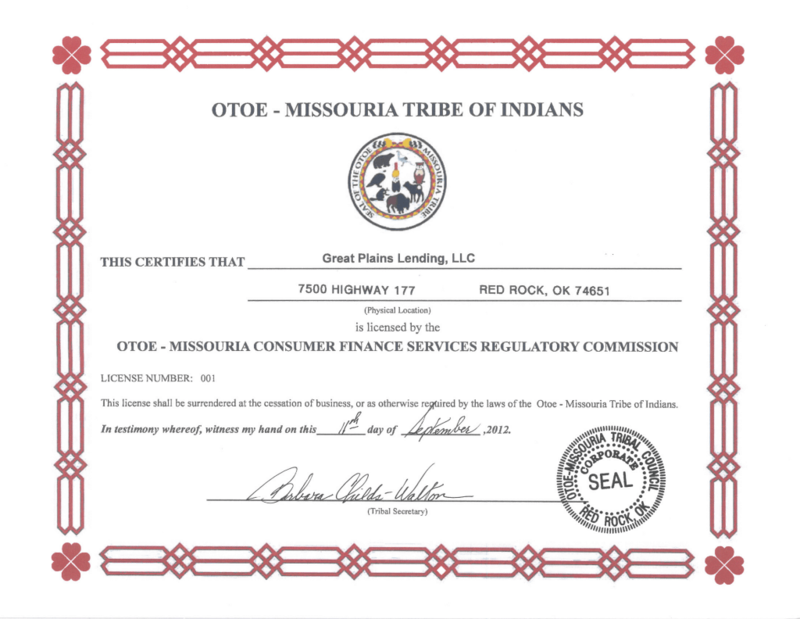 American Web Loan is licensed and regulated under the Otoe-Missouria Tribal Consumer Financial Services Ordinance. Applying is easy. Approvals are fast. Same day funding may be available. Your finance charge and APR will be fully disclosed to you on your loan agreement. AWL never charges any prepayment penalties, so paying your loan off early is a great way for you to save money on interest. How Is American Web Loan different from the other direct tribal lenders? Apply for an installment loan with AWL and you may be able to receive your funds the same day your loan is finalized if processed before our cut-off time. The pay frequency is based on whenever you get paid. The options for pay frequency are monthly, semi-monthly, bi-monthly and weekly. ACH payments must be scheduled at least 2 business days before the debit date. However, validated debit card payments are effective the same day. Wire Transfers: Loans finalized prior to 2:35 p.m. CST (Mon-Fri) should post to the account same business day. Loans processed after this time should post to the account next business day. Direct Deposit: Loans finalized prior to 12:00 p.m. CST (Mon-Fri) have the possibility of posting to the account same day. All loans finalized after this time will most likely post to the account by the end of next business day. (Deposits may take up to 48 hours depending on your bank). AWL can’t make deposits on holidays or weekends. Paper Check: Your paper check will typically arrive at your address on file via USPS shipping within 7-10 business days. Most customers won’t need to send AWL anything. However, we may need proof of income in some cases. 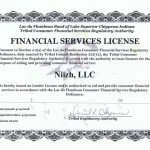 Currently licensed to lend tribal installment loans in ALL states except for: Arkansas, Connecticut, Georgia, New York and Washington. 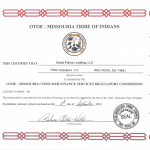 Great Plains Lending is a tribal lending entity wholly owned by the Otoe-Missouria Tribe of Indians, a sovereign nation located within the United States of America, and is operating within the boundaries of the Otoe-Missouria Reservation. Committed to giving customers a loan option that is simple, easy to understand, and hassle free to cover life’s unexpected expenses. How Is Great Plains Lending Better Than Other Direct Lenders? Low APR of 328.11% to 448.76% is less than the average 662.58% APR for a typical payday loan. You can pay your loan off at any time with no hidden fees or surprises! Once approved, your loan can be deposited as soon as the next business day. My Payment Methods – a place for you to review your current payment methods, add debit cards, and update your debit card information. Financial U is an online learning center. The application process is completely confidential and secure. When you submit your online application your results will be available in a matter of seconds. For your convenience, your loan payment dates are linked to your pay dates. If you make a late payment, skip a payment, or a payment is returned to them, they may charge you additional fees. The number of payments on your loan depends on your loan amount and pay schedule. As a general practice, lenders such as Great Plains use data from credit reporting agencies when evaluating applications for credit and making credit decisions. Late Payments, missed payments, or other defaults on her loan may be reflected in the borrowers credit history. Great Plains Lending offers loans ONLY in the state of Oklahoma. We encourage you to pay off your loan early to avoid finance charges. Your total cost depends upon the size of the loan for which you qualify and your payment history. As an example, the Annual Percentage Rate (APR) for a loan of $500 is 328.11%, with 16 bi-weekly payments of $74.18. See the Loan Cost & Terms page for more details. Applying for a loan is easy provided you have the necessary information close at hand. Cash loans up to $1,250 with Blue Trust Loans. Want to know a secret? Apply now for a Blue Trust Loan and you could get up to $2,000 by the next business day. We have exclusive special offers! How Is Blue Trust Loans Better Than Other Direct Lenders? Quick deposits. Once approved, your loan amount can be deposited as soon as the next business day. Easy to understand online application process. More cash at a lower rate for VIPs. Personalized service with friendly representatives. What is Blue Trust Loans? Blue Trust Loans is a tribal lender that offers installment loans of up to $2,000 as an alternative to payday loans. Instead of paying the loan back in full with your next payroll check, Blue Trust Loans allows you to pay it back in installments over a six-month period. Have a verifiable source of income and open checking account. Not be a debtor or in a bankruptcy case. Not reside in AR, CT, GA, MA, MN, NY, PA, VT, WA, WI or WV. ACS Hours:7 a.m. to 8 p.m. CST Monday-Thursday, 7 a.m. to 6 p.m.
CST Fridays and 8 a.m. to 2 p.m. CST Saturdays. Blue Trust Loans DOES NOT offer loans in Arkansas, Connecticut, Georgia, Massachusetts, Minnesota, New York, Pennsylvania, Vermont, Washington, Wisconsin or West Virginia. 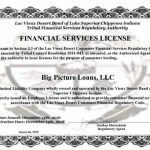 Big Picture Loans was formed by the Tribe to enhance the Tribe’s self-determination and further diversify the Tribe’s economy. 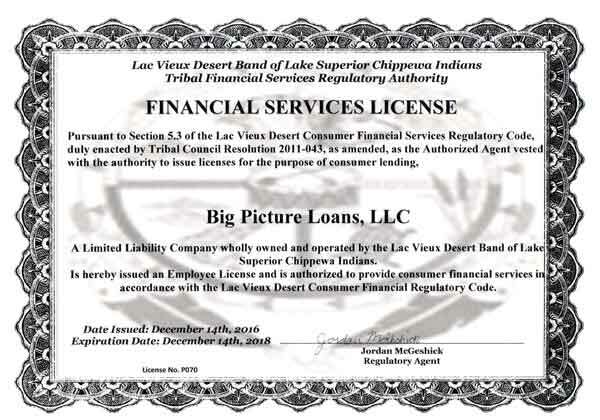 Big Picture Loans is an economic arm and instrumentality of the Tribe that is organized and licensed under Tribal law and is located on the Tribe’s reservation. Get approved in just three steps! Our process is fast! Loan approval and amounts are based on minimum income amounts, other credit criteria, and verification of the information you provide during the application process. Big Picture Loans never charges any prepayment penalties, so paying your loan off early is a great way for you to save money on interest. How Is Big Picture Loans different from the other direct tribal lenders? Choose Big Picture Loans and if approved you may get the funds you need in as little as 24 hours, with no hidden fees. There are no penalties for paying your installment loan off early, and you can actually save on finance charges by doing so. Big Picture Loans performs soft credit inquiry and will not impact your credit score. Expect to hear from Big Picture Loans within 15 minutes to one Business Day after you have submitted your application. Bad credit problems won’t always prevent applicant from being approved for an installment loan from Big Picture Loans. Once you have accepted the loan agreement terms you will not be able to increase the amount of your loan. Once you have accepted the loan agreement terms which includes your payment schedule, you will not be able to change the payment schedule in your loan agreement. Please note that when a payment date is changed, the payment schedule in your loan agreement will remain the same and interest will continue to accrue on any unpaid principal balance. Big Picture Loans does not accept hard copy bank statements. If your bank doesn’t allow three-way call verification, Big Picture Loans will need to verify your income and bank account information through Instant Account Verification. Big Picture Loans tribal lender installment loans are not available to residents of all states, and those states may change from time to time with or without notice. You may contact us at 1.800.584.4880 to verify. It appears that these companies may be operating as online tribal lending companies. These companies assert ownership by the Fort Belknap Indian Community, a federally recognized Indian Tribe. These companies are not licensed by DFI and are not registered to conduct business in Washington State by the Department of Licensing, the Department of Revenue or the Secretary of State. NMLS® Consumer AccessSM is a free service for consumers to confirm that the financial-services company or professional with whom they wish to conduct business is authorized to conduct business in their state. It’s our 25th anniversary this year, so celebrate with us! We’ve been here for you since 1993 to come a long way from our first store in Cleveland, TN and we can’t wait to keep moving forward. We’re the pioneer in the payday lending industry, a founding member of the Community Financial Services Association of America (CFSA), and your One Stop Money Shop ® for the last 25 years. Great news! Lending Point now offers a program for the existing customers to refinance their loans once they have reached 25% of their principal balance paid (subject to credit approval). Reach out to us lendingpoint.com or 888-969-0959. Click here to show a secret offer! I was truly impressed with how easy it was to apply for a loan and how quickly offers to assist me came in. The time-frame from the initial application to having the loan deposited into my account took just a few days. Acquiring a loan through you guys was painless and stress-free. Recently I had a emergency and needed to get help quick. I went to their website which was clear and informative, filled out the quick and easy application and their representative were courteous, quick, and very helpful. In no time at all I had the check in my account. Thank you for being there.